Compact and powerful, IWG-ES series water heaters are ideal for the aircraft environment and especially to high flow situations such as showers and galleys in VIP transports. They are flow activated and perform on-demand. The supply of hot water is limited only by the size of your holding tank. ES aircraft water heating solutions are 115V/ 400hz rated and range in size and capacity from 5 kilowatts to 18 kilowatts and up to 4gpm flow rates. Precision engineered for optimal performance, ES aircraft water heating solutions meet applicable Mil- Spec requirements. All units are made of lightweight aluminum or stainless steel and are built to last. Compact – our aircraft water heaters fit in tight spaces like galley cabinets, in bulk heads, and lavatory sink cabinets. Easy to Install – Just add water and power. All you need is access to one electrical connection, a cold water line, and plumbing to a drain. Safe – Safety is paramount. 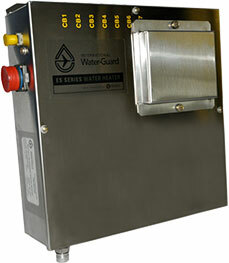 Redundant safety features are engineered into all ES Series heaters to protect people and your investment. They currently meet DO 160 vibration testing requirements, FAA burn testing requirements, and applicable Mil-Spec requirements. Energy Efficient – ES aircraft water heaters are lightweight, and perform on-demand requiring power and water only when needed. Easy to Maintain – The ES Series water heaters require minimal maintenance. For additional information regarding the IWG-ES Water Heaters. Contact us directly.